Two toddler boys are busy building a stable for Jesus out of brightly colored LEGO Duplos. Another tries on a crown and pretends to be one of the three kings on his way to see Mary, Joseph and Jesus in Bethlehem. This is week three of the eight-week fall session at St. Mark Catholic School’s Early Catholic Family Life (ECFL) program, and it’s apparent that the children are happy to be there. So are the enthusiastic mothers who accompany them in a spacious, inviting classroom in the St. Paul school. 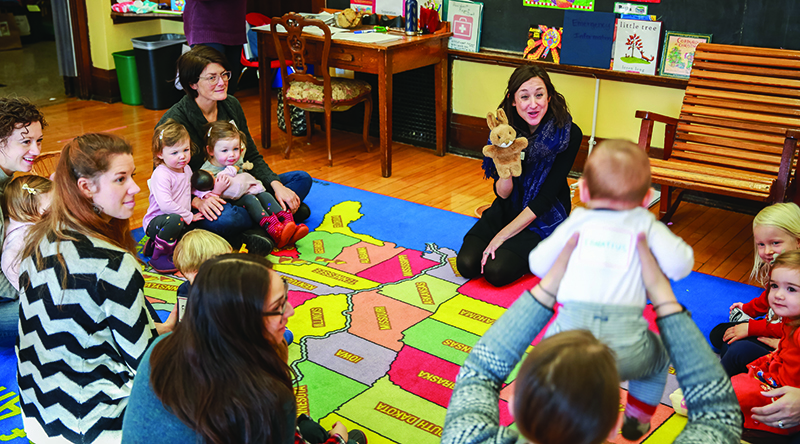 Developed by Joanne and Alan Foley with the help of the Office of Marriage, Family and Life of the Archdiocese of St. Paul & Minneapolis, ECFL connects parents with their peers, facilitates parent-child interaction and teaches parents about child development. The program is similar to Early Childhood Family Education (ECFE) programs in schools throughout Minnesota with one unique difference: ECFL emphasizes the importance of putting the Catholic faith at the center of family life. After 20 minutes of parent-child play time, Overhaug gathers the group for a prayer and the “Hello everybody, how do you do, God loves you today” song, which the children enjoy. Then they practice making the sign of the cross. “Learning to make the sign of the cross at such a young age is such a beautiful gift,” Overhaug said. Then it’s time for the mothers to leave. The children have a snack and continue to play at the stations with Overhaug and a couple of volunteers, before coming together for a Bible story. The mothers head down the hall to a room with a trained ECFL facilitator, Colleen Beatty, who guides the parent discussion portion of the program. Topics include the roles and responsibilities of Catholic parents and children, the spirituality of children and family prayer. Almost two years ago, Beatty moved to St. Paul with her husband and 2-year-old son from the Washington, D.C., area. She was a participant in the inaugural ECFL session at St. Mark’s last winter. “I saw information about the ECFL program in St. Mark’s church bulletin and was excited. I firmly believe that the faith is best taught at home and as early as possible, so the opportunity to learn how to do that better as a parent was a big draw,” Beatty said. Another ECFL parent topic is exploring one’s own faith background and handing the faith on to children. St. Mark parishioner Maria Pedersen, the parent of a 5-year-old son and 2-year-old daughter, also participated in ECFL. One parent discussion topic that especially resonated with Pedersen was a conversation about what it means to keep the Lord’s Day holy. “While we all could commiserate about how easy it is to make Sunday into an errand day or a day to work to prepare for the week ahead, we felt challenged to really set it aside for the Lord in particular ways, especially through Mass and relaxing, fun family time together,” she said. According to Overhaug, the participants in St. Mark’s first ECFL session were all parishioners. She expanded the marketing efforts for the second session to include Facebook blasts and a neighborhood Facebook page. “This time, there are also a couple of school families and some community members as well,” she said.